It is officially autumn now in the UK following the autumn equinox on Friday and it seems that the cold weather is already arriving, even though we barely got to experience a hot summer. However, part of me is exciting for the colder weather to arrive because it means I can get out all my thicker and more snuggly jumpers and pyjamas! I am also excited for the cooler weather to come so I can start rocking darker lip colours. The main colours that I tend to lean towards in the autumn months are browns, burgundy reds and purples. I do wear some of these colours going into winter and Christmas but I wear a lot of red lips during Christmastime so it is mainly autumn where these colours are the stars of the show. Out of the three 'categories', brown lip colours are the most recent addition to my life and I am really excited to start wearing them again. It is also the only category that has its own sub-categories. My two favourite shades of brown lip colours to wear are purple-toned browns, and proper dark browns. It took me a while to find a purple-toned brown that suited me, as they are in the family of shades that might make you look a bit dead. For me, the NYX Lip Lingerie in Embellishment works perfectly. The only slight problem I have with this is that sometimes you still still see the natural pink from my lips around the edges but that's more to do with the natural pigmentation of my lips rather than the liquid lipstick itself. Dark browns are the latest colour addition to my lip life. I've said this many times but it was after watching this video by Jessie from sunbeamsjess wearing the combination of M.A.C Antique Velvet lipstick and Chestnut lip pencil and I bought them both almost straight away. As I talked about Chestnut lip pencil in a recent post, I thought I would just include Antique Velvet in this post. When I wearing this lip combination, I tend to wear my hair up as I already have quite dark hair and against my skin-tone, it can look a little too much if I had my hair down. Antique Velvet has a matte finish but is not as drying as other matte formulas from M.A.C like Ruby Woo. I am still much more into my liquid lipsticks so I am very pleased to have a colour to use that is identical to Antique Velvet. The NARS Powermatte Lip Pigments are still my favourite liquid lipstick formula to date and Done It Again works great. I have a full review on the NARS lip pigments if you want to read more. As I said earlier, red lipstick, especially in the winter months is more associated with Christmas. Although I might wear it a few times during the rest of the year, it is definitely more of a shade that I associate with the festive season. Burgundy is a great choice to wear if you want a bit of the 'red vibe' but not feel too 'Christmassy'. It is complete coincidence that both of these burgundy lip colours are from Rimmel. The Rimmel London Lasting Finish Matte in 107 has become an iconic lip colour within the beauty blogging community as it went through being the phase of being the 'it' lipstick. I still quite like the Rimmel matte formulas as I find that they are very soft to apply, but not in a way that I feel it could smudge easily. Drugstore liquid lipsticks are doing pretty well and the new Rimmel Stay Matte Liquid Lip Colours are definitely bringing their A-Game. The shade Plum This Show impressed me a lot, even though it is more of a burgundy and not a plum. Plum This Show has good staying power but I can find it is a little fiddly to apply but I often find that with darker liquid lip shades. I wrote a post back in May about my ongoing quest to find a perfect purple lipstick. Now although I still don't think I have found 'it', I am becoming more confident about wearing my purple lip colours. I do find that the darker purples tend to look better on me and one of my favourite lipsticks to wear that is in that shade is the Topshop lipstick in Inhibition. It has a red undertone which is why I think I tend to go for it more then other purple shades. One lip colour that I have not worn yet but I am excited to start wearing this season is the Barry M Matte Me Up Metallic liquid lipstick in Avant Garde. I like the original Matte Me Up liquid lipsticks so I am hoping that I like the metallic version just as much. Avant Garde comes a lip kit so it has a matching lip liner which I also have not tried yet. I am hoping that the metallic look will not be too intense or too drying. I have swatched it already and it lasted incredibly on my hand so I'm expecting big things when I wear it properly for the first time. So these are the lip colours that I want to wear this autumn, even if I end up buying and using different lipsticks, these will definitely be the shade categories that I will go for. 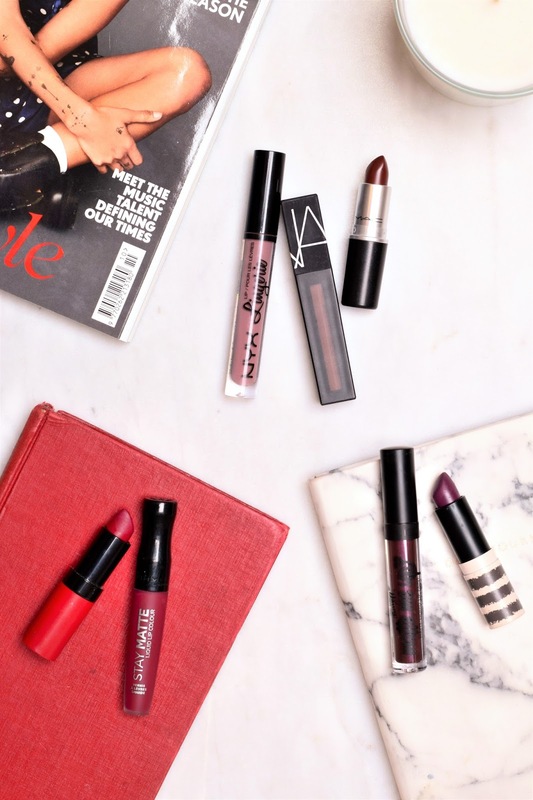 What lip colours or shades of lip colours will you be wearing this autumn?